The Acting Director Army Public Relations, Colonel Sani Kukasheka Usman, in a statement claimed that the Shiite sect attacked the convoy of the Chief of Army Staff, Major-General Tukur Buratai. “The Shiite Sect on the orders of their leader, Ibrahim Alzak-zaky today afternoon in Zaria attacked the convoy of the Chief of Army Staff while on his way to pay homage on the Emir of Zazzau and attend the Passing Out Parade of 73 Regular Recruits Intake of Depot Nigerian Army, Zaria.“The sect, numbering hundreds carrying dangerous weapons, barricaded the roads with bonfires, heavy stones and tyres. They refused all entreaties to disperse and then started firing and pelting the convoy with dangerous objects,” the statement read. The Army said that it considered this a deliberate attempt to assassinate the Chief of Army Staff and members of his entourage and was left with no option than to “defend him and the convoy at all cost as well as open up the barricaded road for law abiding citizens” as this was in line with the Nigerian Army Rules of Engagement and Code of Conduct. On June 24, 2014, three sons of the leader of the Shitte sect, Sheikh Ibraheem Zakzaky were killed following a bloody clash between his members and soldiers in the same city. 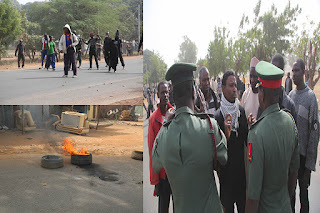 The Shiite Sect on the orders of their leader, Ibrahim Alzak-zaky today afternoon in Zaria attacked the convoy of the Chief of Army Staff while on his way to pay homage on the Emir of Zazzau and attend the Passing Out Parade of 73 Regular Recruits Intake of Depot Nigerian Army, Zaria. The sect numbering hundreds carrying dangerous weapons, barricaded the roads with bonfires, heavy stones and tyres. They refused all entreaties to disperse and then started firing and pelting the convoy with dangerous objects. The barricade was obviously a deliberate attempt to assassinate the Chief of Army Staff and members of his entourage while on a legitimate official assignment as Special Guest of Honour at the passing out parade which has earlier been widely publicized. The troops responsible for the safety and security of the Chief of Army Staff on hearing explosion and firing were left with no choice than to defend him and the convoy at all cost as well as open up the barricaded road for law abiding citizens. This is in line with the Nigerian Army Rules of Engagement and Code of Conduct. This kind of behaviour will not be tolerated from any individual or groups and should not be allowed to repeat itself. We wish to implore all Nigerians to continue to be law abiding and remain conscious of other peoples right to life, freedom of movement and passage. The Chief of Army escaped unhurt and continued with his duties.